Restore a Bright Smile Today! Are you tired of hiding your mouth when smiling or taking pictures? You do not need to let tooth discoloration dull your confidence any longer. You can get a dazzling bright smile with teeth whitening in North Austin. Dr. Candace Bruno has the solutions you need to turn back the hands of time with an in-office or at-home whitening treatment. Unfortunately, you cannot avoid tooth discoloration because it occurs naturally as you age. Over time, the hard-outer layer of your teeth, known as the enamel, becomes thinner. Underneath it is the dentin, which has a yellowish hue. As more of the dentin becomes visible, your teeth turn yellow. Besides aging, there are other factors that influence the severity of the changes. Consuming darkly pigmented foods and drinks frequently cause your enamel to stain. In addition, smoking or poor oral hygiene can also accelerate discoloration. How Can I Get a Bright Smile? At the first sign of staining, you likely tried over-the-counter products, like a whitening toothpaste. Although you had high hopes, you were quickly left disappointed. While they may be convenient, home products do not contain professional grade whitening agents, so they cannot penetrate your enamel. The can only offer slight improvement, but the results will not last. The only way to get the drastic, lasting results you want is with the help of your cosmetic dentist in North Austin, Dr. Bruno. 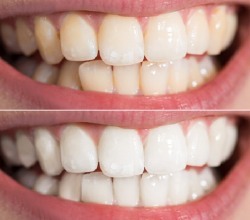 You can get your teeth several shades whiter after just one appointment. Dr. Bruno applies a protective barrier to your lips and gums to avoid causing any irritation to the tissue. She then puts the whitening gel on your teeth. Not only does it whiten them, but it is also specially formulated to condition your teeth to reduce the risk of tooth sensitivity. A special light is used to activate the whitening agent. It deeply penetrates your enamel to resolve tough stains. After just one appointment, your teeth can be as much as 8 shades whiter. Now, you can enjoy the benefits of an in-office treatment from the comfort of your own home. Dr. Bruno provides you with custom-fit trays to ensure the even distribution of the whitening agent for consistent results. You use the trays and the whitening gel as recommended for about 2 weeks. After just a few days, you will notice your teeth are visibly brighter. You will get professional-quality results around your own schedule. Brush your teeth twice a day using a fluoride toothpaste. Floss every night before going to bed. Limit your contact with stain-causing foods and drinks. Visit your dentist twice a year for a cleaning and checkup. Get a Bright Smile Today! If you are ready for a bright, beautiful smile, it is time to see your dentist in North Austin. Contact our office today to see which whitening treatment is right for you.